Gluten free cookbooks and yarn. It's what's going on at the library on this stormy Wednesday. We've been spending a lot of time at the library this week because, well.... the library has air conditioning and it's been raining. A lot. They also have a giant card board box and puppets for the kids! I'm starting over on the shawl I frogged last weekend. The shaping is looking much better this time, but it's really discouraging to look at. 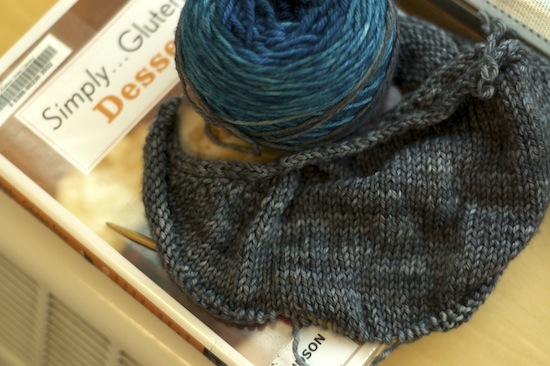 Mostly, I'm not knitting the shawl and finding new recipes for gluten free treats. I'm really in need of some good gluten free recipes. Any ideas?